The crowd got into it in the final stretch when the score was tied with a minute to go. Sunday’s stop in Columbus marked my first trip to America’s third-largest university campus and my first time attending an Ohio State basketball game. On this particular day, the Buckeyes welcomed rival Michigan State, the nation’s 22nd-ranked team, to town for the regular-season finale. The Spartans won the teams’ first meeting, 72-68, in East Lansing in January. As a newbie in Value City Arena, I made several rookie mistakes that could have been easily prevented had I been properly educated by a seasoned vet prior to the game. That is why I’m here with a list of Do’s and Don’ts for the next first-timer out there, whoever that may be. If the game is scheduled for 4:30 p.m. ET, you need to be in your seat by 4:30 p.m. at the very latest. Fifteen to 30 minutes early is ideal. 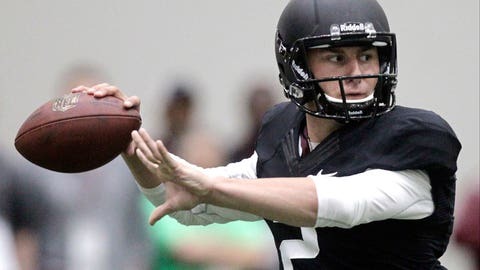 The FOX Sports College Basketball Road Trip ran into some unforeseen complications leaving Peoria, Ill., Sunday morning so we were a little behind getting to the arena. Our late arrival meant missing out on Aaron Craft’s Senior Day ceremony, his long-waited farewell after what felt like two decades in the Buckeyes backcourt. Value City Arena has the most delicious heap of nachos a fat kid like me ever laid eyes on. With homemade cheese sauce, all the necessary toppings one needs, and a portion size fit for an entire family, the nachos are a must. It would be a sin to attend a game without buying a bowl and diving in. Trust me on this one. DON’T order the nachos if you have a phobia involving public restrooms. I’ll leave it at that. DO sit next to someone you’re willing to kiss. 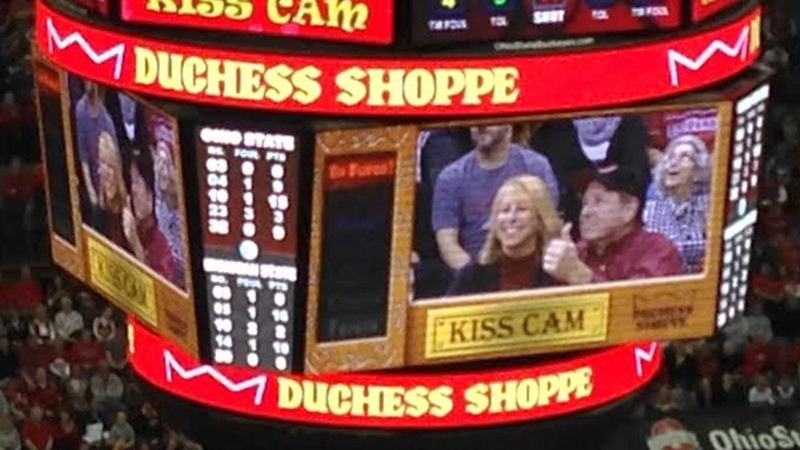 You never know who the Kiss Cam will find during the first media timeout of the second half. To be safe, I advise you to make sure the person on either side of you is someone you’re willing to plant one on if your number is called. And if you find yourself in this situation, be sure to give a thumbs-up after the smooch for an extra roar from the crowd. Unless a seeing eye dog led you to your seat or you have a pop song on the Billboard Top 100, it is never OK to wear sunglasses indoors. NEVER. That’s the sound of 18,000 people laughing at you, man. DO be silent during halftime. You could hear a pin drop in the building when the teams were in the locker rooms during the break. The halftime show – Google "David Garibaldi art" – was an entertaining show, but fans sat silently in their seats for 15 minutes. It was eerily quiet inside, a rare stillness for such a big college basketball game. It may be frowned upon, although you certainly will stand out if you do. DO lock arms and sway during the final minute. The crowd got into it in the final stretch when the score was tied with a minute to go. 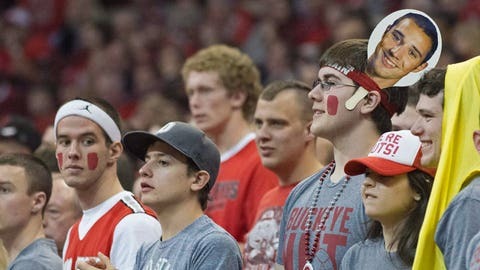 Most of the fans in the lower level locked arms and swayed in unison as rock music blared from the arena’s speakers, fueling the Buckeyes to eke out a two-point victory. DON’T yell at the opposing coach as he walks off the court. Michigan State head coach Tom Izzo traded words with a female OSU fan in the crowd as he made his way back to the visiting locker room after the loss. When asked about the heated exchange in his postgame press conference, Izzo said he couldn’t repeat what the young lady shouted toward him, but he did get the last word. "She was a jerk, to be honest with you," Izzo said.